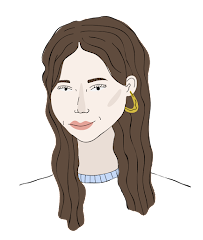 My skincare routine is always changing, I feel like I haven't tried enough products yet to be able to say, nope I wouldn't use anything else (apart from maybe the Liz Earle cleanse and polish, that is quite amazing!). But I'm always open to trying new products and seeing what works and what doesn't. I never feel right writing daily routine posts because I'm always introducing new products, so I thought I'd start a new monthly series. Since moving my room around, my bedside table is now the home of my daily skincare products so I thought I'd just show you what's currently on there and what I'm taking out and what I'm bringing in. 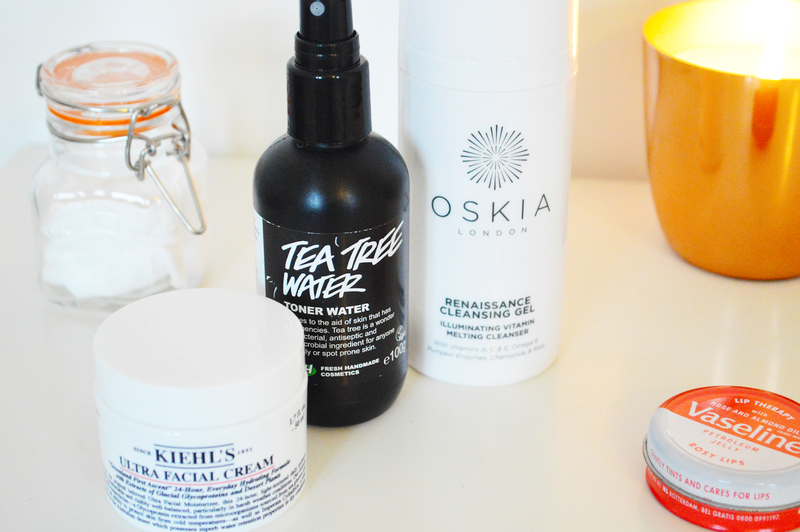 So new in is the Oskia Renaissance Cleansing Gel, which I got for Christmas. It's an orange colour gel formula that melts into an oil as you rub it into your skin. I find this breaks down make-up so well, I tend to just rub it all over my face and then wash it off with a muslin cloth. I tend to only use this at night and only in the morning if my skin is looking especially sorry for itself. But I don't like to overload my skin too much in the morning. I haven't noticed too much of a dramatic change since using this, however I think it has added a bit more of a glow to my skin. If I don't cleanse in the morning then I'll usually start with the Lush Tea Tree Water. I do use this morning and night, at night I use it after I've cleansed. This has definitely become a new staple, I love it so much. I did do a whole post on it over here, but for tackling spots this is my current go-to product. As for moisturiser I use the Kiehls Ultra Facial Cream, which is such a good daily moisturiser. It settles into the skin so quickly and keeps you hydrated through-out the day. Finally I top off my current routine by applying some good old Vaseline, which is so good at keeping my lips smooth and hydrated. So yeah, I'll try and keep this series up because I like finding new skincare products. I also thought this would be a good thing to look back on, to remind myself of what I used to use, what worked and what didn't! I love this set up my love!! Also I so want to try the Lush tea tree toner .. I have heard such amazing things about it !! Fab post my love ... I will definitely give these products a go .. I am due to switch up my skin care routine soon too ha! 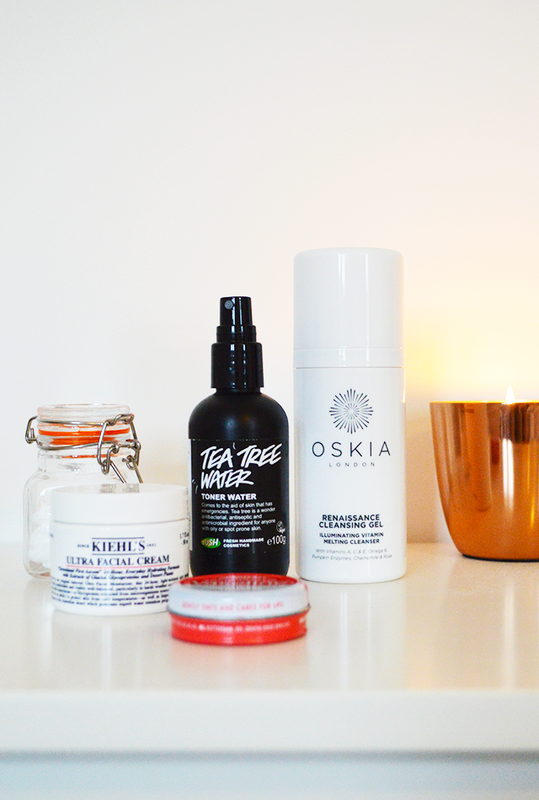 The Oskia gel is one I really do want to try, I always seem to hear amazing things about it! The Lush toner is now back in my life and I adore it, I don't know how I managed for the time I didn't own it! Fab post Millie, I love seeing what products other people are using! The Lush tea tree water sounds interesting - I've been meaning to pop into Lush for ages so I may have to give it a go! I love that you're honest about the fact that you like to change up your routine too, there's definitely no harm in that. I love the Kiehl's Ultra Facial Cream, I have dry skin in the winter and my skin just loves it! Been meaning to try the Lush Tea Tree water for ages now! Love your photography. I absolutely love LUSH so I don't know how I've missed the tea tree water! I definitely need to get my hands on this to help my spots! Great product picks, they look awesome. the ultra facial cream is amazing. kiehls skin care is just the best. i'd love to try the oskia cleansing gel.